SSR LLC – PPG/Akzo – Is the Negotiation Over? 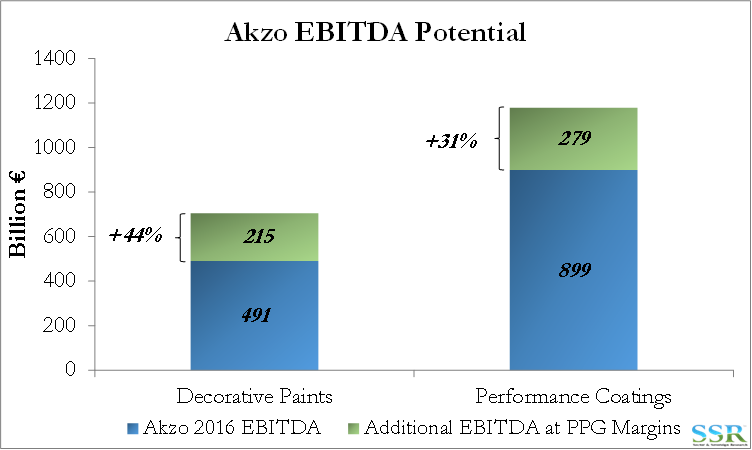 PPG/Akzo – Is the Negotiation Over? We interpret the PPG “higher offer” today as likely a mostly negotiated deal. Given the attention that is being paid to both management teams today it would be impossible for them to get together to hammer out a final agreement without it leaking. What we believe we have seen today is the price at which a deal can get done – is acceptable to both sides – but the due diligence still needs to be done formally and the agreement needs a mountain of paperwork. There is no reason for PPG to continue negotiating against itself – and consequently we believe that some agreement has been reached with Akzo. If the new offer was conditional on Akzo allowing PPG to do further due diligence, then the offer would have been made on that basis and made public on that basis. Clearly PPG will want to do additional due diligence, but we suspect that the company already has a pretty good idea of what it is looking at. As we have written in prior research, we think this deal is good for both sets of shareholders; clearly a better deal for Akzo holders than any go-it-alone strategy that we can think of or that the company could put forward. We estimated that PPG could pay up to €100 per share before there was risk that PPG could not make the deal accretive and good for PPG holders. The current offer is €96.75 per Akzo share at the current PPG price, giving PPG a little wiggle room in our view during any formal due diligence process. We would continue to own both stocks – PPG is still relatively cheap on a normalized basis and this deal gives the company a growth story for several years. Akzo still has considerable upside to the offer price. We stress that the primary opportunity for PPG is to improve the margins in the coatings business – see chart – something that PPG has managed well with other acquisitions, including Akzo’s US decorative paint business. There is a secondary opportunity with the chemicals business, where we would expect PPG to show the same patience it did with its own chemicals business before most likely divesting to someone with the ability to consolidate and improve the margins of that business. Possible buyers would be WLK, OLN or one of the European independent PVC players – we think that Ineos would be prohibited from buying the business.